After great success in its first year, the Valle Food & Wine Festival returns for a second run with a star-studded lineup of chefs, including celebrity chef Rick Bayless, Netflix Chef’s Table stars Nancy Silverton and Dominique Crenn, acclaimed Baja chef Javier Plascencia, Top Chef Jonathan Waxman, and many more, as well as over 25 of Baja California’s most lauded winemakers, brewers, musicians and artists. 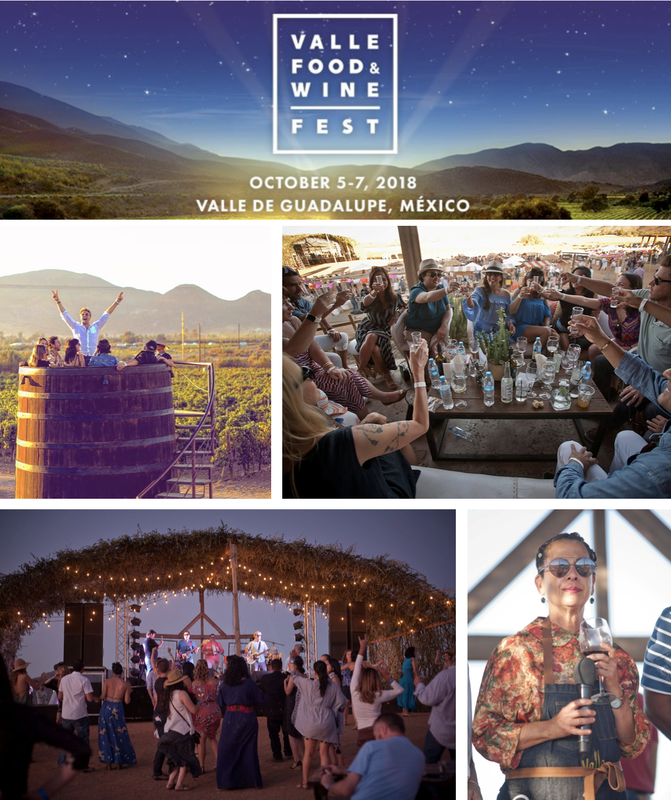 The only event of its kind in one of the world’s buzziest travel destinations, the multi-faceted festival will take place this October 5-7 in the heart of Mexico’s wine country, Valle de Guadalupe, amidst rugged terrain and lush vineyards only a short 2 hour commute from downtown San Diego. Valle de Guadalupe, the Mexican wine region located approximated 65 miles south of the border and 15 miles northeast of the city of Ensenada, is currently one of the "it" travel and wine tasting destinations, garnering spotlight features in The New York Times, The Los Angeles Times, Condé Nast Traveler, Vogue, Travel & Leisure, Wine Enthusiast, Wine Spectator, Food & Wine, Sunset Magazine, and within over 200 publications. Nestled in a peaceful valley surrounded by picturesque mountain ranges, until recently the Valle was one of Northern Baja California’s best-kept secrets. Although it is often compared to Napa Valley of days past, as the famed former New York Times restaurant critic Ruth Reichl put it - "the Valle is very much its own land. It is a place of extraordinary beauty. A place where the air is filled with the music of crowing roosters, and the vegetables are filled with extraordinary flavor." 35 celebrity chefs from both sides of the border will be making history on October 6. Be there! Ticket prices jump Friday. The Valle Food & Wine Festival kicks off on Friday, October 5, from 6-10pm, with an exclusive cocktail party and dinner prepared by Javier Plascencia alongside elite local chefs to honor chef Rick Bayless and to present the VFWF’s Lifetime Achievement Award to Baja culinary trailblazers Benito Molina and Solange Muris. Wine and dine with 60+ renowned chefs and winemakers including stars Nancy Silverton, Dominique Crenn, and Jonathan Waxman. One hundred percent of the proceeds from a live auction, hosted by celebrity auctioneer Billy Harris, will benefit the Corazón de Vida Foundation, a non-profit organization that that has been providing life-changing support for orphaned and abandoned children in Baja California for 25 years. "After cooking with Javier in Valle de Guadalupe last summer, I fell in love with the place, the people, and the rustic, over-fire style of cooking," said celebrity chef Nancy Silverton - one of the most acclaimed and influential players on the American culinary scene who recently rose to worldwide fame after she was featured on the award-winning Netflix series, Chef’s Table. "I knew I wanted to come back and to give back to this place." The main event of the Valle Food & Wine Festival will take place on Saturday, October 6, from 4pm to midnight, at Javier Plascencia’s gorgeous Finca Altozano al fresco eatery. In addition to the food and wine stations where guests will have the opportunity to meet the chefs and winemakers, there will be a Celebrity Chef Book Signing and a Meet-the- Winemaker unique wine experience steps away from the festival under the stunning 200+ year old Animalón tree. There will also be an artisan market, shops and a children's corral for coloring, decorating, and other activities. Participating chefs at this year's Valle Food & Wine Fest main event include Rick Bayless, Nancy Silverton, Dominique Crenn, Jonathan Waxman, Javier Plascencia, Benito Molina, Brian Malarkey, Jason McLeod, Trey Foshee, Jason Knibb, Flor Franco, Claudia Sandoval, Andrew Spurgin, Solange Muris, Ori Menashe, Walter Manzke, Nancy Oakes, Chandra Gilbert, Dahlia Narvaez, Ryan DeNicola, Martin San Román, Drew Deckman, Miguel Ángel Guerrero, David Castro Hussong, Sheyla Alvarado, Giannina Gavaldón, Angelo Dal Bon, Denise Roa, Adria Montaño, Ruffo Ibarra, Marco Marín, and Bianca Castro-Cerio. Closing out the festival weekend, on Sunday, October 7, starting at noon, don't miss the De La Calle Al Valle Street Food Festiva, taking place under the oak trees of El Kiosko de Santo Tomás, featuring over 10 of Baja's best street for vendors and casual eateries, paired with artisan beer and live entertainment. Participating eateries include La Guerrerense, La Cocina de Doña Esthela, Tortas WashMobile, Mariscos Ruben, Tacos Fitos, Taqueria Criollo, Muelle Tres, HUMO, Troika, and La Carmelita. Tickets for the Valle Food & Wine Festival are available online starting at $40. Promo code SDVILLE saves 15% per ticket. Valle De Guadalupe is located approximately one hour and 45 minutes from downtown San Diego in what is an easy and most beautiful drive or Uber. Those looking for a round-trip shuttle, VIP transportation, spa services, restaurant reservations, and/or accommodations should contact event partner and Mexico travel experts Baja Wine + Food at concierge@bajawinefood.com. For more information about the 2nd annual Valle Food & Wine Festival and to purchase tickets, visit vallefoodandwinefest.com.